Technology moving very fast and most of the Graduates from Engineering background (ECE/CSE/IT) are passionate about to learn more things especially from Telecom sector. In addition to that they want to make acquainted with latest developments happening in telecom sector in order to improve their skills much better. 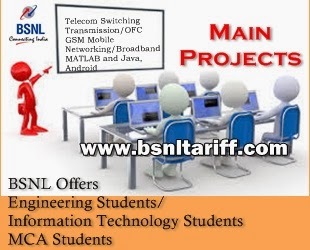 In this course Most Trusted Telecom brand in India Bharat Sanchar Nigam Limited (BSNL) offers Engineering (BE/B.Tech) students/Information Technology students/MCA Students to part with Major Telecom Projects conducting at BSNL Hyderabad. Well established BSNL Regional Telecom Training Center (RTTC) at Hyderabad (Gachibowli) is an ISO 9001:2008 and certified prestigious center for telecom training conducting ‘Major Projects for Engineering/IT Students’ of B.Tech (IV) year second semester and MCA students on familiarization of latest telecom technologies for 50 hours duration on different categories like Telecom Switching, Transmission/OFC, GSM Mobile, Networking/Broadband, MATLAB and Java, Android subjects. Who can participate in Major Projects? BE/B.Tech students (IV year second semester) in the disciplines of CSE/ECE/IT/ETM etc. Students can apply for projects with permission from competent Authority from College or can apply directly by following terms and conditions. Eligible and interested candidates can download ‘Registration form’ online and after filling application details submit the same to the given below correspondence address along with Registration Fee. Candidates can pay the registration fee ‘Payment Modes’ and BSNL provides Hostel facility (Optional) Lodging and Boarding with nominal charges Rs.163/- per candidate per day on Three sharing basis. Where to Apply for Main Projects? Your post is really very helpful. Easy to learn as you explain things precisely. Thank you so much.